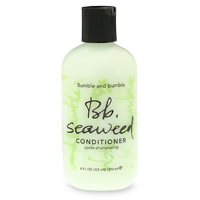 Bumble and Bumble SEAWEED CONDITIONER,it detangles, smoothes the cuticle and makes hair much easier to manage, without weighing it down. It contains Seaweed extract which conditions and makes hair shine. For all types of hair. Use it after every shampoo, if you wish, especially on long or chemically treated hair. Squeeze out a dollop, and with your fingers, a comb, or a brush, work it through. Leave it in for a few minutes, then rinse thoroughly.